Still trying to upload pictures from my camera from that Manila trip. 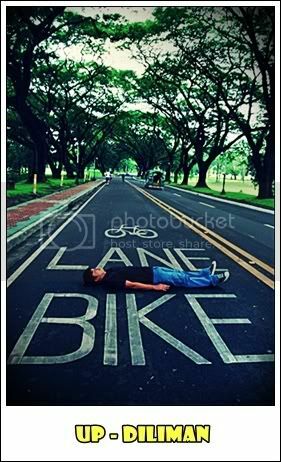 We went to UP Diliman (finally) and I have to blog about how I was able to go to Enchanted Kingdom but not enter. Hahay. This is the second time around that I was able to go to Manila, being all excited to go to Enchanted Kingdom but never being able to go inside. It turned out that a telecommunications company held their family day the same time that we arrived. I tried my best to just talk to one of the staff there to let us in since there were only two of us and we went all the way from Cebu to Manila to Laguna just to fulfill my childhood wish of being able to go inside Enchanted Kingdom. It's been my frustration ever since I was 11 years old. Doi insisted that I just take a picture with the wizard outside but I didn't want to. However, we still got a couple of pics but my smile was sarcastic in a lot of ways. I lost the desire to talk since I was really down. I felt like a little boy who saved all his money to buy a bike he's been eyeing on in a store window. Upon finally being able to come up with enough cash, the bike was no longer there because it's been bought by somebody else. Boohoo. I want to commend your effort and reward your persistence. Next time you are in Manila, contact me and I will provide you FREE access to the park. Hopefully you will enjoy the park and discover that, no, it hasn’t been bought by somebody else after all. And that it is real and exciting! Hi Richard, actually I’ll be back in Manila for a business trip. 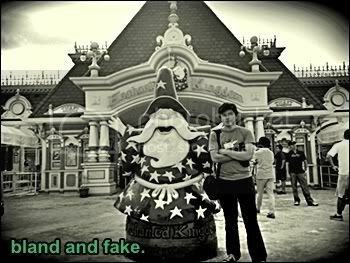 I’ll only have a day to spare and by that time, I’ll be trying my luck again in going to Enchanted Kingdom with a friend on May 23, 2009, Saturday. Hopefully, as I’ve checked the schedules on the website, I’ll be able to go inside since it will be open for public. Thank you for the offer. I’m looking forward to fulfilling this childhood wish. Hope to hear from you soon. ay! nakaka-aliw. Parang nagmistulang Fairy God Father si Mr. Richard. =) i love this 7 links.. I get to read all interesting entries from famous bloggers. Kahit nahalukay pa sa baul yan. Two thumbs up! aww.. anaskit! where is Justice?